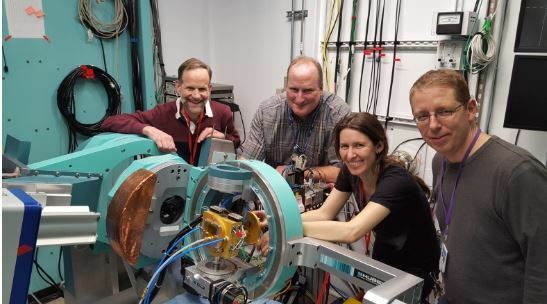 Share STEM Spark Energy News! Each STEM Spark Energy Education Newsletter will focus on the latest K-Grey Energy Education resources, competitions, and innovations from the Department of Energy and will highlight a variety of energy technologies. Please share with your education and workforce development community. Sign up here to subscribe to the monthly newsletter! The Department of Energy's SunShot Initiative is working to make solar energy cost competitive by the end of the decade. 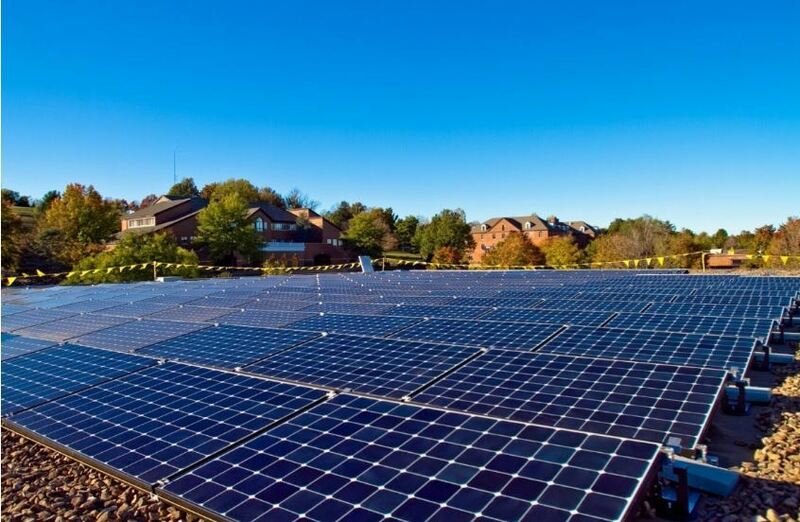 The office funds cooperative research, development, demonstration, and deployment projects to drive down the cost of solar electricity to $0.06 per kilowatt-hour or $1 per watt (not including incentives). Five years into the Energy Department’s decade-long SunShot Initiative, the solar industry is already more than 70% of the way to achieving SunShot’s cost target. Solar radiation, often called the solar resource, is a general term for the electromagnetic radiation emitted by the sun. Solar radiation can be captured and turned into useful forms of energy, such as heat and electricity, using a variety of technologies. However, the technical feasibility and economical operation of these technologies at a specific location depends on the available solar resource. Read about basic principles here. What is Solar Photovoltaics (PV)? Photovoltaic (PV) materials and devices convert sunlight into electrical energy. A single PV device is known as a cell. An individual PV cell is usually small, typically producing about 1 or 2 watts of power. To boost the power output of PV cells, they are connected together in chains to form larger units known as modules or panels. Modules can be used individually, or several can be connected to form arrays. One or more arrays is then connected to the electrical grid as part of a complete PV system. Because of this modular structure, PV systems can be built to meet almost any electric power need, small or large. Watch video. 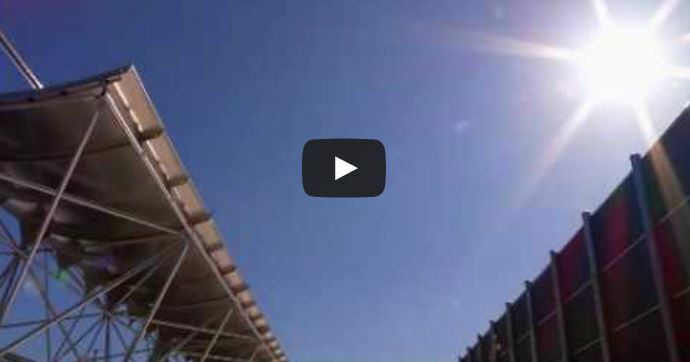 What is Concentrating Solar Power (CSP)? Concentrating solar power (CSP) technologies use mirrors to reflect and concentrate sunlight onto a single point where it is collected and converted into heat. 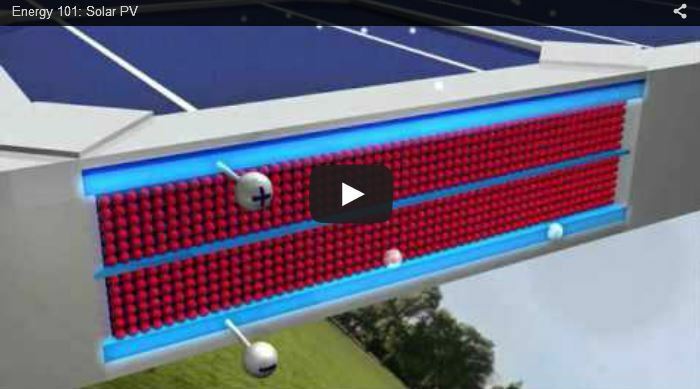 This thermal energy can then be used to produce electricity. Concentrating solar power systems are generally used for utility-scale projects. 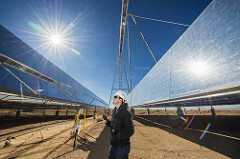 The mirrors in CSP plants focus sunlight onto a receiver that heats a high-temperature fluid, which is used to spin a turbine or power an engine that drives a generator. The final product is electricity. Read more and watch video. Dormitory mini fridges, dishwashers in dining halls, and campus computer labs are just a few of the things that can create large utility bills for colleges and universities across the country. 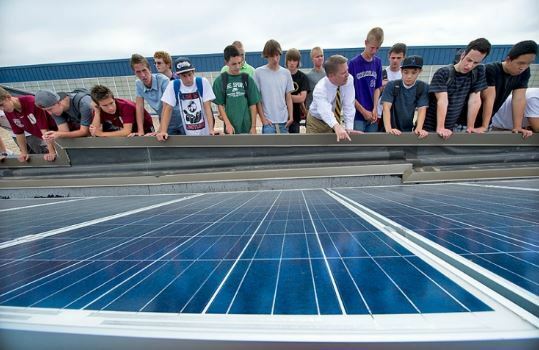 The SunShot Initiative is working to make it easier for college campuses to use solar energy to help ease the financial burden of around-the-clock operation. Read more about Solar Market Pathways. 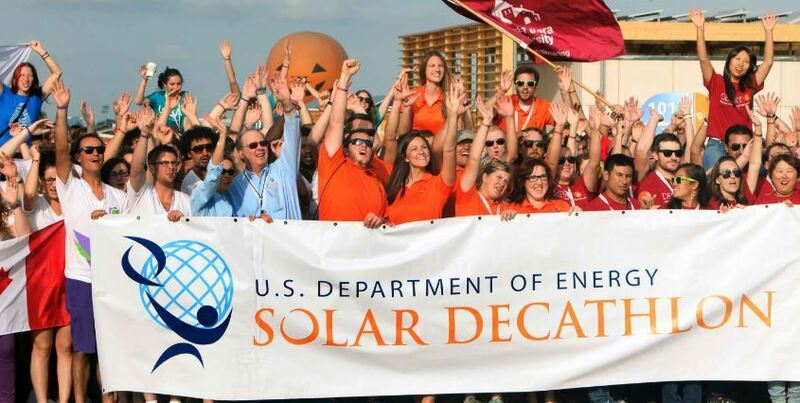 The U.S. Department of Energy Solar Decathlon challenges collegiate teams to design and build full-size, solar-powered homes that push the limits of innovation in a series of 10 contests. The winner of the competition is the team that best blends design excellence and smart energy production with innovation, market appeal, and energy and water efficiency. The Solar Decathlon is October 5-17, 2017 in Denver, Colorado and free to the public. Since 2008, hundreds of thousands of solar panels have popped up across the country as an increasing number of Americans choose to power their daily lives with the sun’s energy. You may be considering the option of adding a solar energy system to your home’s roof or finding another way to harness the sun’s energy. While there’s no one-size-fits-all solar solution, here are some resources that can help you figure out what’s best for you. Consider these questions before you go solar. As any athlete will tell you, going back to the basics when practicing a sport can provide a refreshed perspective on skills that will improve overall performance. One SunShot Initiative awardee found the same principle can be applied to the science behind the decades-old practice of attaching metal contacts to solar cells. Read more about BRIDGE. 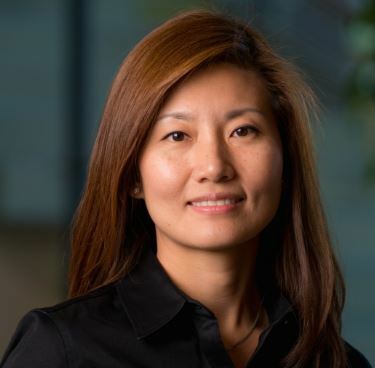 Nora Wang is an engineer in the Building Energy Systems group at Pacific Northwest National Laboratory. She has ten years of research experience in building energy efficiency and sustainability. She received her doctorate in architecture from the University of Illinois at Urbana-Champaign. She began her career in architecture, gaining experience on international projects and winning several design competitions. In 2007, Nora led the Illinois Solar Decathlon team to win two contests in Washington D.C. More Women@Energy. When the SunShot Initiative launched in 2011, it set the goal of making solar electricity cost-competitive with conventional sources of electricity by 2020. Since then, solar deployment has grown more than tenfold in the U.S. with more than one million solar installations currently operating across the country. 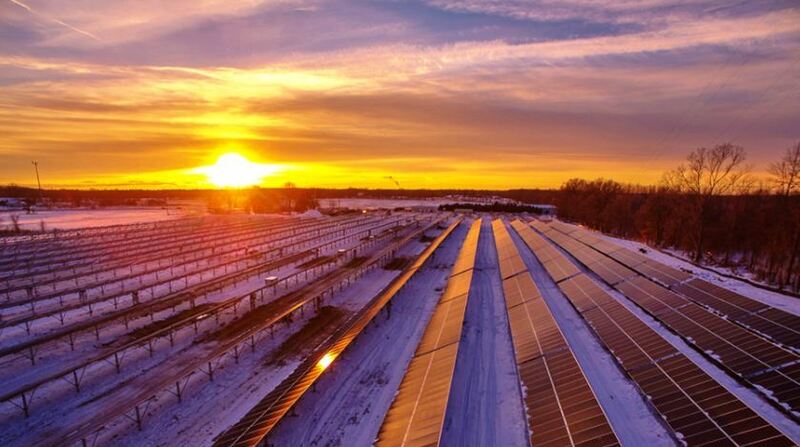 The cost of solar energy has also dropped as much as 65%. As a result, the industry is approximately 70% of the way toward meeting the SunShot 2020 goals. Join the challenge! Have your class or entire school make a solar project and post pictures on your social media channels using #energy, email us at stemspark@ee.doe.gov and follow us on Facebook and Twitter. We look forward to connecting with you! BioenergizeME Infographic Challenge Sign up September 30, 2016! Science Undergraduate Laboratory Internships October 7, 2016 Deadline - Sign up NOW! We will be sending out monthly newsletter announcements. Share this link with anyone interested in learning more about all the fun we are having at the Department of Energy. Update your subscriptions, modify your password or email address, or stop subscriptions at any time on your subscriber preferences page. You will need your email address to log in. If you have questions or problems with the subscription service, contact support@govdelivery.com. This service is provided to you by the U.S. Department of Energy's Office of Energy Efficiency and Renewable Energy (EERE).